This project for the Albert and Shirley Small Special Collections Library was managed by Jim Gibson at Gibson Design Associates. He worked closely with Robert Perkins, the University of Virginia Library’s Associate Librarian for Philanthropy and Sean McCord, the library’s Audio-Visual System Engineer. Rounding out the core team was Gibson Design’s lead developer Christopher Gibson. The construction of the library itself was supported by a generous gift from Albert & Shirley Small. From the beginning the plans included a two-room museum to house Albert Small’s unique personal collection of memorabilia related to the American Declaration of Independence. The collection includes many versions of this historically significant document, including a rare “Dunlap” broadside which was printed just days after the declaration was approved. The museum also houses letters of the founding fathers, portraits of every signer of the declaration, and even a collection of later documents from all over the world that were inspired by the declaration. In the museum, most of these documents are hung on the wall at eye level or higher, a setup that doesn’t cater to—or attract the interest of—children. Therefore the library decided to create an interactive feature that would not only be appealing to adult visitors, but also make the contents of the museum accessible to a younger audience. Gibson Design Associates won this project in part on the strength of having previously designed two coffee-table books about the American Declaration of Independence, one for the Library of Congress and a second about Albert Small’s collection. Gibson Design Associates’ extensive work for other institutions and historical sites was also an asset as they crafted this interactive table kiosk. The Declaring Independence Exhibit is a touch-enabled “coffee-table” that sits about three feet tall. The hardware is the Platform 46 Coffee-Table, purchased from Ideum (www.ideum.com). Their newest version of this interactive pedestal display is called the Ideum Duet 46. Learn More about using our new KioWare for Windows to lockdown your browser and secure your public access device. KioWare kiosk software wraps around existing browser-based applications, securing the OS and browser, and allowing users to access only your application. 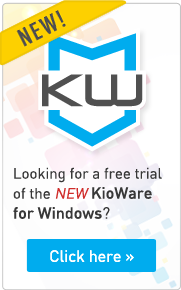 KioWare is fully customizable with a product line ranging from basic browser-lockdown to server based remote monitoring. University of Virginia and Thomas Jefferson Foundation. Ideum (ideum.com) is an innovative design company based in Corrales, New Mexico. The firm focuses on creating the next generation of visitor experiences that blend both the physical and digital realms. Along with its Creative Services software group, Ideum designs and produces integrated and hardened large-scale multitouch tables and touch walls for museums, educational institutions, government agencies, and Fortune 500 companies. It has developed multitouch tables and screens since 2008 and they have been sold in 37 countries. Albert & Shirley Small are longtime supporters of the University and the Library, Albert (‘46) and Shirley Small made a substantial gift toward the construction of the special collections library that bears their name and houses Mr. Small’s remarkable collection of autograph documents and rare, early printings of the Declaration of Independence.